Comics for Companies: A Unique and Entertaining Way to Advertise and Promote your Products and Services! Krishna Sadasivam creates custom comics and illustrations for organizations, magazines and companies. A champion of comics advocacy, Krishna speaks, blogs, and writes articles on illustration and sequential arts techniques and the importance of the comics medium in both education and brand awareness. With 15 years of professional experience, his clients include The Smithsonian Institution, Microsoft, Mashable, India Currents, Tau Beta Pi, Other World Computing, Bandai Namco, Typemock and EE Times. His work has been featured on many notable websites, including TechCrunch, Gizmodo and CNET. His portfolio can be found at krishnadraws.com. Comics, because of their visual nature, have universal appeal to readers both young and old. They're easily adaptable to take advantage of the medium they are presented in, whether it's the web or print. Plus, they're also fun to read! Don't bombard your customers with a boring press release! Studies have proven that images offer higher retention rates when compared to text. Comics, with their coupling of images and text, are a terrific medium to convey complex concepts in a simple, concise format. Stand apart from the crowd - use comics to get your point across! When was the last time a press release went viral? Comics, by their very nature, lend themselves to being quickly and easily shared. (Many online comics have gone viral.) Comics can aid in knowledge retention. In the era of short attention spans and social media, a little humor can go a long way in spreading your message. What Can Comics Do For Your Company? Think outside the box! Use comics to get your message across in a unique and entertaining way. Custom comics can make a mark where press releases and brochures don't. Comics are great marketing tools to help your product or service stand out from the pack. A funny comic can be shared many, many times over. Ask yourself this: How many folks look forward to receiving press releases in their already overstuffed inBox? Change it up with comics so your message doesn't get lost in the noise. Other World Computing, makers of Mac and PC hardware solutions, approached me to create a comic series featuring their company mascot (Globeman). The Other World comic series has been running on the OWC blog for over two years. The Other World squarely focuses on tech humor, with an emphasis on educating customers about the OWC product line. Microsoft commissioned a series of comics as part of their Hello Secure World secure coding initiative. My goal was to write and illustrate 12 comics to educate software developers on the importance and practice of proper coding techniques. Custom comics can be as general or specific, depending upon the client's need. In this particular case, the material was targeted specifically toward software developers. 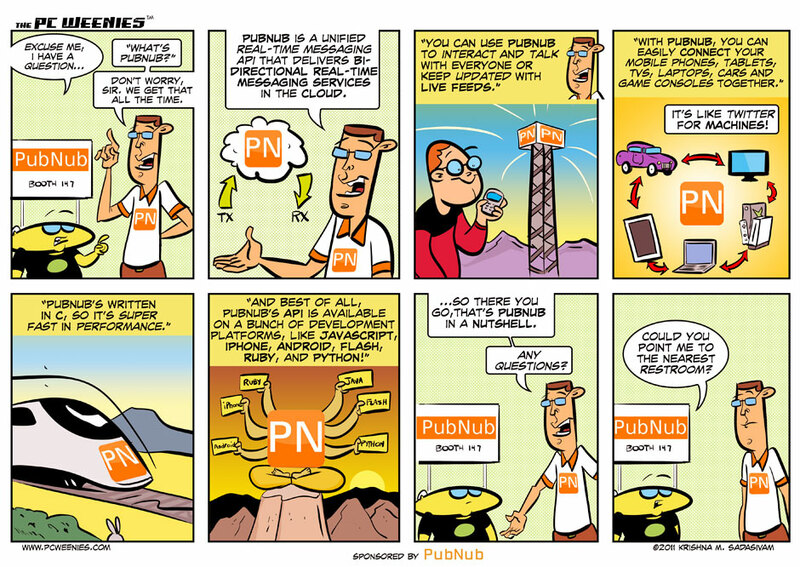 Stephen Blum, from PubNub, approached me to create a custom comic strip to educate clients about the PubNub Real-Time Network. The challenge was to clearly convey the advantages of the company's offering in an approachable and humorous way. Krishna made it easy to promote our brand with creative illustrations matching the style of his popular toon. Our short conversation lead to a completed illustration. Krishna exceeded our expectations. The comic strip for SMTULSA conference is more awesome than I could have imagined. The process was seamless, and working with Krishna was so much fun. I'll definitely be back. Thank you. Krishna provided great work in a timely manner and a great price. He was a pleasure to work with but the results really are what stood out. I'd highly recommend hiring him for graphics work. One of our goals in developing our blog was to offer varied, yet relevant technology content so it would become a destination site for a variety of readers. Since April 2010, the two monthly custom created PC Weenies comics have become a truly valued and anticipated regular feature of our blog. The comics are truly unique and often capture the humorous side of interactions with technology to which readers can certainly relate. Beyond the comics themselves, working with Krishna is beyond compare. He's prompt in communication and content, takes suggestions easily, and has never once given me a reason to part ways. We love the work that you did and you were very accommodating!! =) Not only did you complete the project in a timely manner, but revisions were also quick! We'll definitely recommend you to others who are looking for creative marketing solutions. For me, the most important part of the comic-making process is understanding my client's needs. After an initial consultation, a price quote will be sent. After the terms are agreed upon, I dive into the writing process. After this stage, I send the scripts to the client for review. Once the script has been cleared, I proceed to penciling the comic. Generally the penciling process takes me a few days. After the pencils are complete, a rough draft of the comic is sent to the client. Upon approval, I proceed to inking and coloring the final comic. Let my comics work for you! Contact me at pcweenies@gmail.com so I may learn more about your objectives and mission. I love design challenges! I'm ready for the draw, dependable, hard working, and obsessively focused on making my clients happy. But don't take my word for it! Ask my clients! Looking for my comics? Visit PCWeenies.com! © Krishna M. Sadasivam. All Rights Reserved.